...is what I have been doing today! One of the best things in the world when it is snowy, and cold, and just plain yucky outside. So let's just get right to it! Instructions: Fold yellow cardstock in half to make card base, and round the bottom corners. Round the bottom corners of a flocked dot paper block and adhere to the front. Punch a scalloped border to the top of a yellow script paper block. 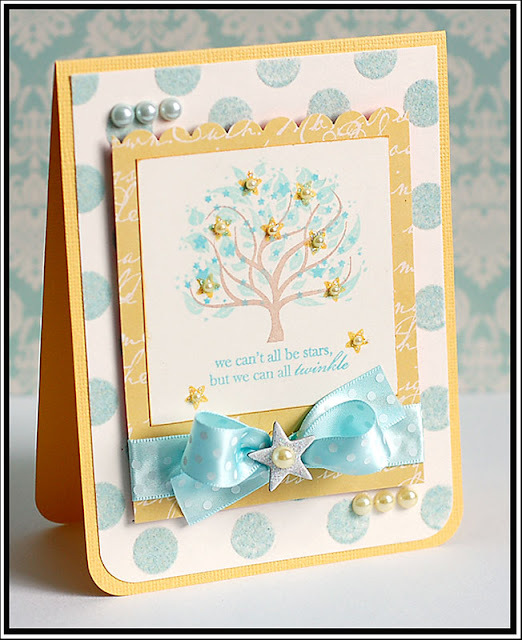 Stamp the tree, stars and sentiment to a cream cardstock block. Adhere to the yellow paper block, and accent with Stickles and yellow pearls. Tie ribbon around the bottom of the entire block, and adhere it to the front of the card using dimensional adhesive. Paint and glitter a chipboard star white, and adhere to the middle of the bow. Accent the middle of the star with a yellow pearl. Adhere light blue and yellow pearls to the opposite corners as shown. 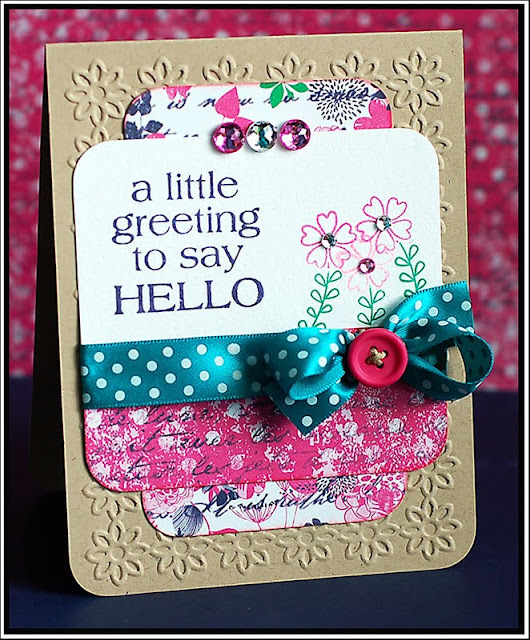 The next two cards use sketch 85 from the Clean & Simple Stamping blog. I love how one sketch can look completely different...even if the same person is using it more than once! Here is the first sample, using these fabulous Lawn Fawn stamps....I just love them! Eeek! Instructions: Fold kraft cardstock in half to make card base. Punch a border to a turquoise cardstock strip and adhere to the left side. Adhere a floral paper strip to the left side, and zig zag stitch alongside the seams. Tie ribbon around the strip, and attach a button to the bow using twine. Stamp the sewing machine and sentiment to the front, and then stamp a button border along the bottom and right edge. Accent the stamping with jewels. And here is card #2 using the same sketch as above. Totally different look! And, oh how I love this Delightful Dahlias stamp set...it seriously makes me smile every time I break it out and use it!! Instructions: Fold blue patterned paper in half to make card base, and round the right hand corners. Round the right hand corners of a white cardstock block. 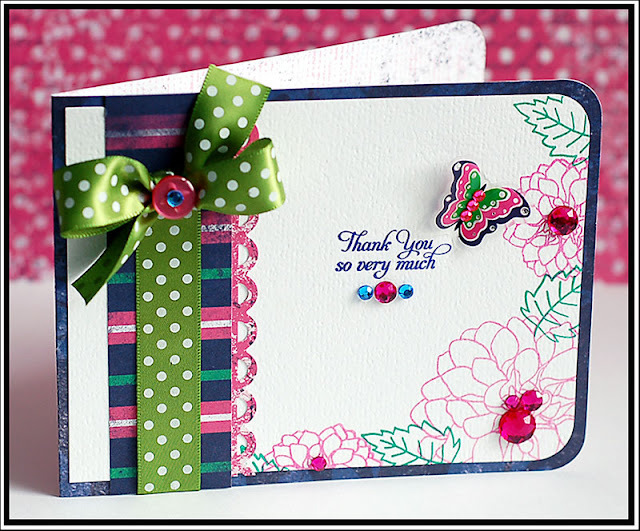 Stamp the flower and leaf border to the right side, and adhere to the front of the card. Punch a scalloped border to pink paper, and adhere to a striped paper block. Adhere the entire block to the left side of the card. Tie ribbon to the left side, and accent the bow with a button and jewel. Stamp the sentiment to the middle, and accent with jewels. Add the butterfly sticker to the right of the sentiment, and accent the middle with jewels. Instructions: Fold kraft cardstock in half, and round the bottom front. Emboss the front of the card using a Cuttlebug and With Gratitude embossing folder. Round the corners and ink the edges of a floral paper block, and adhere to the middle. Round the corners of a white cardstock paper block. Round the bottom corners and ink the edges of a pink dotted paper strip, and adhere to the bottom of the white block. Stamp the sentiment and flowers to the white cardstock, and accent the flowers with jewels. Tie ribbon around the seam, and attach a button to the bow using twine. Adhere the entire paper block to the front, and accent the top of it with three jewels. And I just realized that every single one of these fits the current challenge at Our Creative Corner...which is to use bows! Tee hee...the entire post fits! Yay! Well, in some other random news. We bought a new TV. Not that we REALLY needed a new one, but it was priced to sell because it is a clearance model...so we decided to use some of Josh's bonus for it. So, we are now the owners of a 58" Samsung plasma television...I will admit, it is pretty sweet. It is only 3" bigger than our old TV, but the picture quality is definitely better. I can't wait until it has been on for 100 hours so we can calibrate it. We watched some of the Master's on it the other day....and I thought the nuclear color of the green was going to burn into my retinas. We are keeping it on all the time in order to get to that 100 hours...should be good to go by the end of the week! Yay! And I am getting something fun too! I will be ordering the Nikon 105mm micro lens that I have wanted forever tonight! It is going to be an awesome portrait lens, and it also does double duty for macro photography. I cannot WAIT to get it and play around with it. So exciting! Ugh! Your Cards are SOO darn cute! 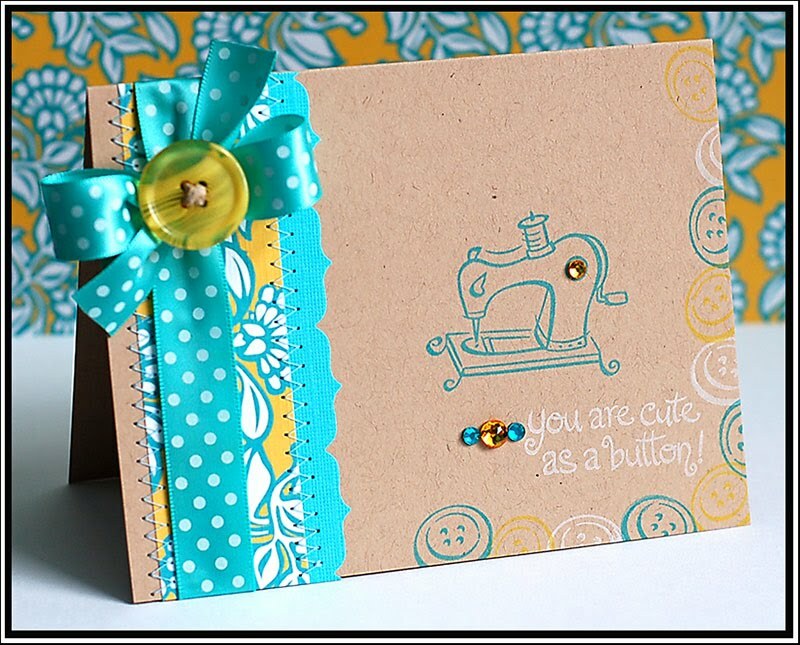 I'm loving that lawn fawn sewing machine stamp---SOOO DARLING!! You've been a busy lady!! Mind you with snow outside, I think I'd be doing the same thing!! Lovely set of cards. Congrats on the 58" - wow! We went HD a year ago (know hubby wishes it could have been a 58 incher LOL! )and it is simply amazing to be able to see the blades of grass on the gold course. Enjoy :D Congrats on ordering your new lens. Nothing better than some new toys! May have to get a few pointers from you on photos as I built a light box and am having a heck of a time with lighting so have gone back to the window sill for now. awww... your cards are fabulous! I love them all! Everything you do is always so so so gloriously elegant and beautiful. Awesome cards Lea! You inspire me! Love 'em all, Lea but that first card is absolutely stunning! Such a great stamp and sentiment, but what you did with the pearls and such. It takes it to a whole new level. Just incredible! Fabulous cards! I love the colors, embellishments... great images... especially the tree... TFS! Lea, I just love that first card! LOVE the soft blues and yellows and the tree is so cute. The other cards are wonderful too, always fun to see new ideas. Gorgeous cards Lea, but they ALWAYS are!!! I LOVE all the bright colours you use, a girl after my own heart! I love that first sentiment too, it's lovely! Love them all Lea... Hope you and the family have been well. Gorgeous cards...I love them all. By the way, the ribbon you use on a lot of your creations is truly fabulous. Lea. You cards are fabulous - but the We can Twinkle one is drop dead gorgeous. A masterpiece. thanks so much for sharing your photographic and crafting talent.